The last time we chatted, it was onward and upward from Mobile to New Orleans, as we meandered through the South. We’ve decided that our Franco-philia can be well-satisfied in the Crescent City. This is a place where one can easily imagine Marie Antoinette and Louis XVI having settled post French Revolution, were it not for that unfortunate business with the guillotine. An oft-employed icon of French royalty — and one of which we are quite fond — the fleur-de-lis, abounds in the architectural details of buildings, wrought iron fences and balconies, on every imaginable object and clothing item and — our personal fave — on paper. It won’t surprise you then that one of our goals on this trip was to shop for paper and writing instruments. At Re-find, we prefer this to the usual T-shirts or kitschy travel mugs when it comes to souvenirs, not that there is anything wrong with the former. But one can never have too much quality paper for thank you notes, proper letters, jotting or doodling. In the French Quarter, we stumbled upon Papier Plume, which is owned by a charming Frenchman. It is a well-edited space on Royal, with a lovely — albeit somewhat masculine — selection of leather-bound notebooks, ball point and fountain pens and other fine papers. That said, we were hoping for a place just a tad more feminine and with slightly more variety in the price department. After all, one must save her pennies for delicious bites and cocktails when in New Orleans. We didn’t visit the area the last time we were in town, but had a good feeling about Magazine Street, what with it’s reputation for miles-and-miles of boutiques. Turns out, we were spot on. 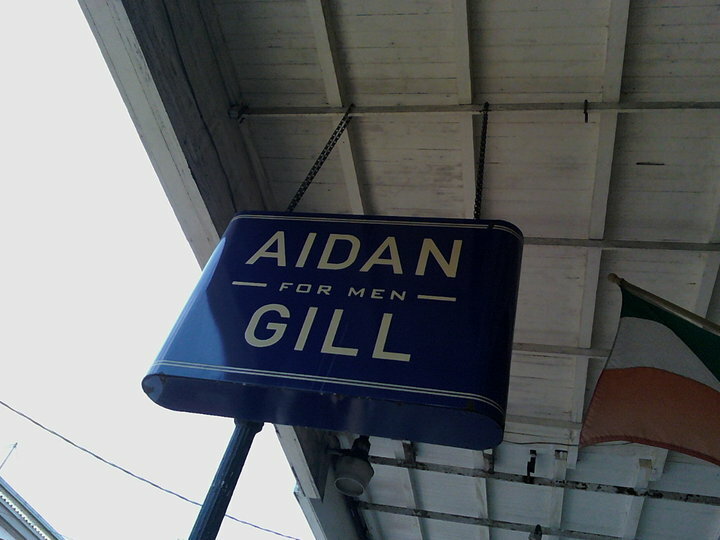 One of the first places we stumbled upon is the most magical shop, Aiden Gill for Men. 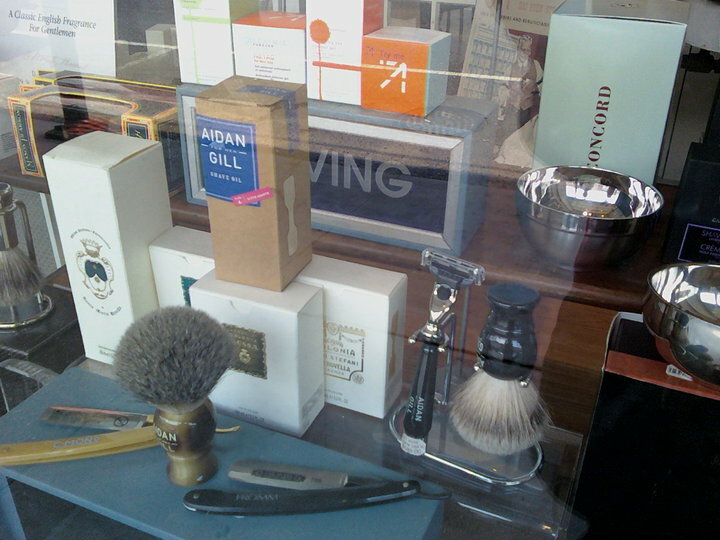 It’s filled to the rim with old school razors and brushes; ties (bow and neck) and cufflinks; men’s toiletries and accessories, such as Masen Pearson brushes and combs; books for men on etiquette and dressing; and a barber shop in the back, where one receives a whiskey or a beer — of course — with every cut ($35). We purchased two books as gifts for our nephew,”How to Be a Gentleman: A Timely Guide to Timeless Manners,” and “A Gentleman Gets Dressed Up: What to Wear, When to Wear it, How to Wear it,” both by John Bridges. We think these books should be in every young man’s library, especially during etiquette or special occasion dressing emergencies, when the auntie is unreachable for advice. The kind, knowledgeable and dapper staff at Aiden Gill recommended a stationery store down the road and we were back to the task at hand. Soon, we landed at Scriptura, a fine stationery store where we played, petted and swooned for far too long. It’s a wonderland of custom, personal, novelty and wedding papers for every occasion or, just because. The store’s own line, Celebrate New Orleans, offers cards, notepads and papers with streetcars, crowns and fleur-de-lis, to name a few. Part of the proceeds go toward the ongoing effort to rebuild and renew post-Hurricane Katrina. It is here, that we found a simple, stainless steel Pilot fountain pen and a little slice of heaven.